In an RL series circuit, a pure resistance (R) is connected in series with a coil having the pure inductance (L). To draw the phasor diagram of RL series circuit, the current I (RMS value) is taken as reference vector because it is common to both elements. 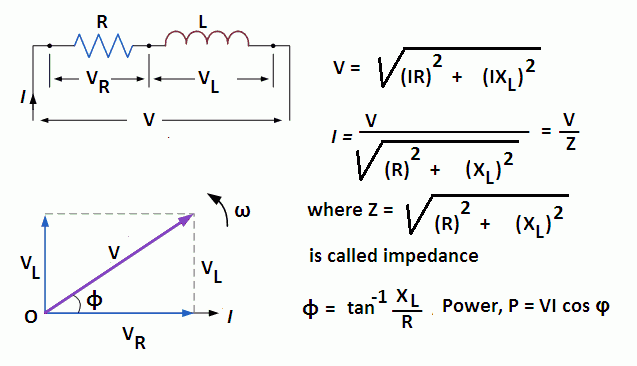 Voltage drop VR is in phase with current vector, whereas, the voltage drop in inductive reactance VL leads the current vector by 90o since current lags behind the voltage by 90o in the purely inductive circuit. The vector sum of these two voltage drops is equal to the applied voltage V (RMS value). The power waveform for RL series circuit is shown in the figure. 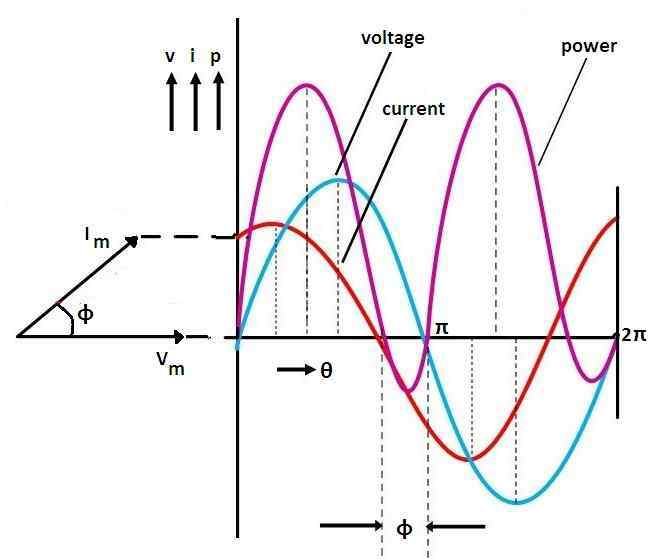 In this figure, voltage wave is considered as a reference. The points for the power waveform are obtained from the product of the corresponding instantaneous values of voltage and current. It is clear from the power waveform that power is negative between 0 and φ and between 180o and (180o + φ). The power is positive during rest of the cycle. Since the area under the positive loops is greater than that under the negative loops, the net power over a complete cycle is positive. Hence a definite quantity of power is consumed by the RL series circuit. 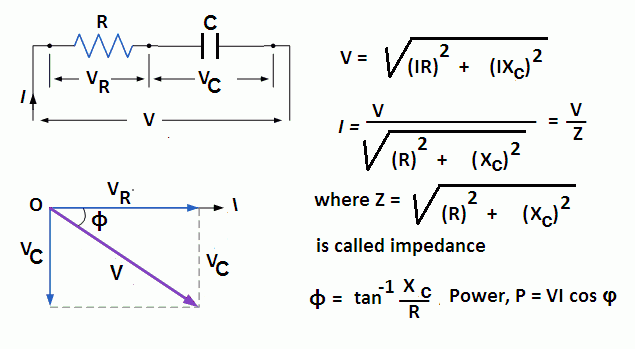 But power is consumed in resistance only; inductance does not consume any power. In an RC series circuit, a pure resistance (R) is connected in series with a pure capacitor (C). To draw the phasor diagram of RC series circuit, the current I (RMS value) is taken as reference vector. Voltage drop VR is in phase with current vector, whereas, the voltage drop in capacitive reactance VC lags behind the current vector by 90o, since current leads the voltage by 90o in the pure capacitive circuit. The vector sum of these two voltage drops is equal to the applied voltage V (RMS value). The power waveform for RC series circuit is shown in the figure. 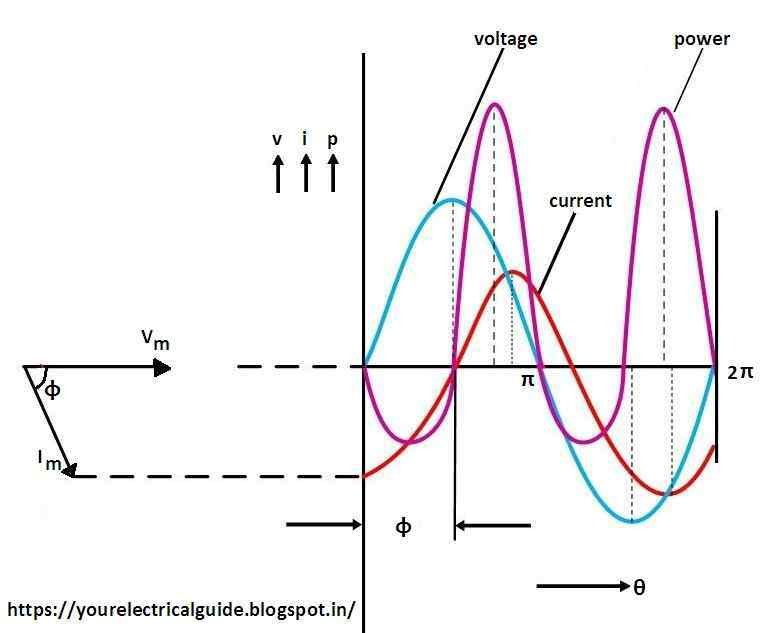 In this figure, voltage wave is considered as a reference. The points for the power waveform are obtained from the product of the corresponding instantaneous values of voltage and current. It is clear from the power waveform that power is negative between (180o – φ) and 180o and between (360o – φ) and 360o. The power is positive during rest of the cycle. Since the area under the positive loops is greater than that under the negative loops, the net power over a complete cycle is positive. Hence a definite quantity of power is consumed by the RC series circuit. But power is consumed in resistance only; capacitor does not consume any power. In an RLC series circuit a pure resistance (R), pure inductance (L) and a pure capacitor (C) are connected in series. 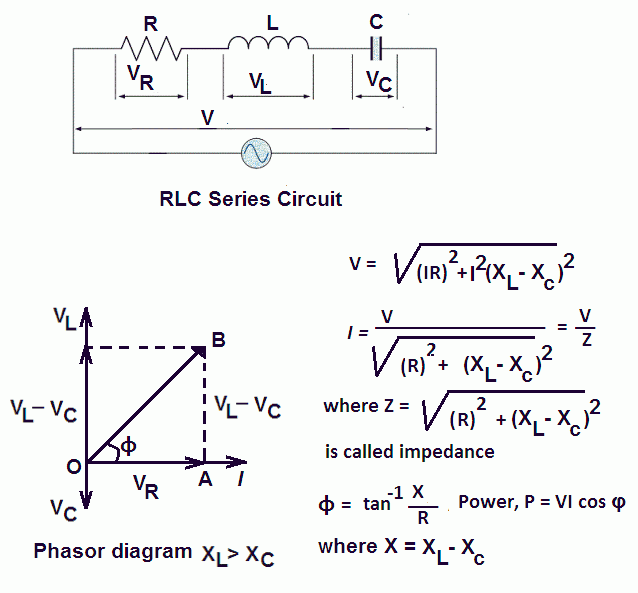 To draw the phasor diagram of RLC series circuit, the current I (RMS value) is taken as the reference vector. The voltages across three components are represented in the phasor diagram by three phasors VR, VL and VC respectively. The voltage drop VL is in phase opposition to VC. It shows that the circuit can either be effectively inductive or capacitive. In the figure, phasor diagram is drawn for the inductive circuit. There can be three cases of RLC series circuit. i = Im sin (ωt – φ). i = Im sin (ωt + φ). i = Im sin (ωt). © http://www.yourelectricalguide.com/RL | RC | RLC Series Circuits.